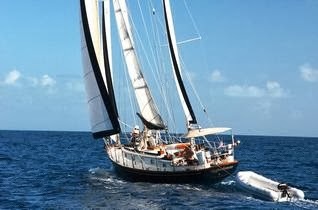 Wednesday and Thursday we sailed from St. Martin to Antigua to see the Antigua Classic Yacht Regatta. More on that later. As we departed St. Martin we spotted the boat pictured. Odd looking mega-yacht you say? Well, that's because it's not a mega-yacht. You see, apparently having a megayacht is just not enough these days. You're really not anybody unless you have a yacht support vehicle for your mega-yacht. These boats, pretty "mega" themselves from my perspective, follow the main yacht around carrying toys (like the large sailboat on deck in the picture) and carrying all those dozens of pesky crew members that you might not want cluttering up your main yacht when they're not serving you. 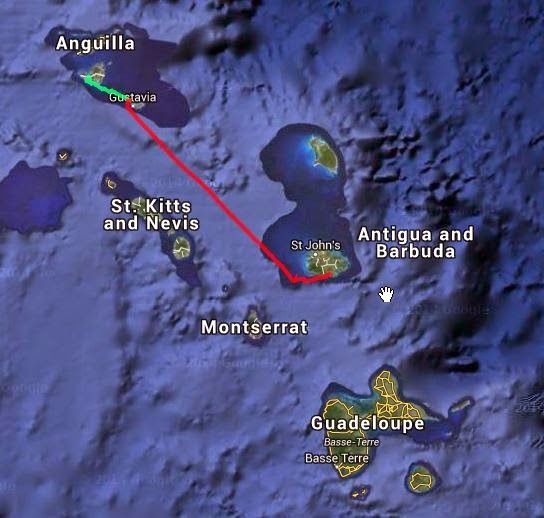 Details on our passage from St. Martin to Antigua are below in case you're interested. The advice for a more pleasant sail is to head to St. Barts, then to Nevis, then to Guadaloupe, then back to Antigua. This isn't mandatory; it just depends on how much unpleasantness one wants to tolerate. We don't like upwind passages any more than anyone else (Ok, maybe a little more), but we would have endured this because we really wanted to make Antigua Classic Yacht Regatta. (I should note that how unpleasant such a passage is also depends on the type of boat, the course sailed, and the sails raised. Simply motoring upwind with no sails raised as I see many do is almost always a bad idea in anything but calm weather). We did motor-sail to St Barts to break up the passage. While this knocked 18 nm off the trip, it didn't change the sailing angle to Antigua appreciably. However, the forecast was for the wind to back to about 85 degrees magnetic from the usual 105-125 degrees. To make our desired track of 146, we needed to sail about 136 degrees to account for the current and for leeway. This puts the true wind about 50 degrees off the bow, which makes our point of sail a close reach. This let us make the SW corner of Antigua with no tacking. The winds were 15 gusting into the low 20s. In these conditions, we usually take a reef or two in the main at night for safety. We had made good enough progress this passage that we just dropped the main and sailed under genoa and mizzen alone with good progress. Overall it was a pretty comfortable sail. We are not selling the boat. More on Antigua Classic Regatta in later posts.